Ascent Adventure Consultants and Dancing Elephants Achievement Group announce a partnership to offer new and powerful sales training seminars. Motivated by a common desire to see people succeed, the companies have worked together to develop a creative mix of sales training and experiential training to help sales forces deal with common business concerns. The Ultimate Training Experience, a Different Kind of Training Adventure. Industry trends in the corporate world show that the popularity of experiential training is on the rise. To that end, Ascent Adventure Consultants LLC and Dancing Elephants Achievement Group have teamed up to offer powerful corporate sales training seminars under the banner "The Ultimate Training Experience, a Different Kind of Training Adventure." Using the combined experience of both companies in developing team building strategies and helping sales forces succeed, Ascent and Dancing Elephants have developed courses to deal with common business and sales concerns, including cold calling, presentation skills, negotiation skills, and time management. By involving experiential education and training, these courses are designed to develop creativity, confidence, leadership, listening skills, decision making and personal character. Participants in the seminars will receive powerful, interactive, sales-focused training that creates unstoppable teams, leading to incredible sales success. "We're very excited to join in a partnership with Ascent Adventure Consultants," said Dancing Elephants principal and owner Tim Moore. "Dancing Elephants takes great pride in providing sales and business training that is of the highest quality. Ascent Adventures has the same commitment to delivering meaningful, impacting training programs. This partnership allows us to add experiential training to the mix that will reinforce, enlighten and motivate any company." "People learn through experience," added Ascent Adventure Consultants owner and founder Brandon Hensinger, who has been actively involved in guiding and experiential education for over seven years. "What better way could there be to learn sales techniques than to learn them experientially, and in a unique a creative way that will not be forgotten?" To feel confident in selecting a training curriculum with recognized professionals as facilitators, visit AscentAdventure.com or DEAGSales.com. 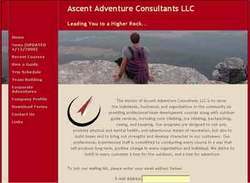 Ascent Adventure Consultants LLC, based in Apex, NC, offers professional, customized and fully portable team building strategies and corporate training courses to businesses and community groups, as well as guided outdoor adventures that include rock climbing, backpacking, and kayaking. The company is fully insured and offers teambuilding and training courses, as well as outdoor adventures for every experience level, aiming towards helping individuals with personal growth and businesses with morale and productivity. Dancing Elephants is dedicated to helping corporations to create vibrant, successful sales cultures by applying the principles of ethical selling. Customized training is offered through on-site group programs, monthly sales meetings, workshops, and speaking engagements. The company also offers formal classroom training conducted under the name Elephant University. Dancing Elephants was awarded the Cary Chamber of Commerce 2006 Small Business Employer of the Year.